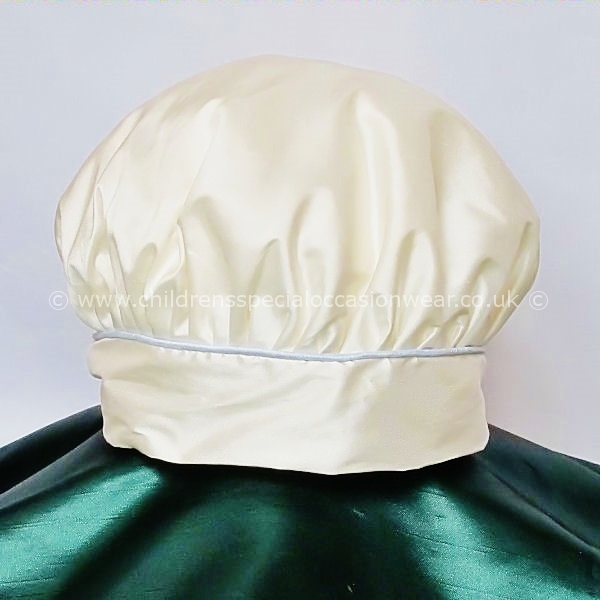 Baby boys Millie Grace silk hat, available in ivory with contrasting pale blue piping. This beautiful fitted ivory hat in a beret style is fully lined and has a pale blue piped trim above the brim. This hat will beautifully compliment our silk Millie Grace christening rompers including Bobbie, Austin, Butler, Louie & Max. This baby boys hat is hand made to order here in England UK by designer 'Millie Grace' so once you have placed your order, please allow 2 - 4 weeks for completion (more information will be provided after you have placed your order). If you are ordering this hat in addition to a Millie Grace christening romper, they will be made and sent together.